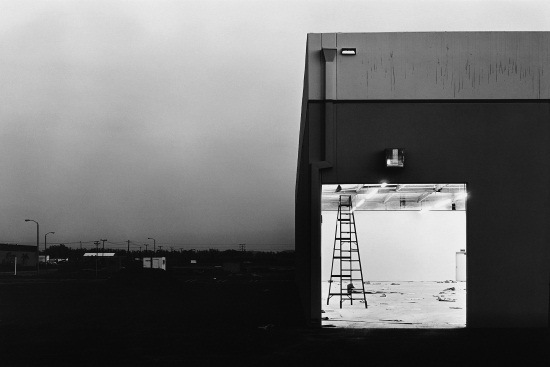 Lewis Baltz is a local boy, born in Newport Beach; he was one of the original photographers to participate in the seminal New Topographics exhibit during the 1970’s. The exhibit, or more importantly the work exhibited has had a major impact on landscape photography and planted the seeds of the current Wasteland movement. Baltz is currently based in Paris and Venice. He also is a professor of conceptual photography at the European Graduate School in Saas-Fee, Switzerland, where he conducts an Intensive Summer Seminar. Someone should send my there! I need a patron. Or a shot of patron. I feel like I know quite a bit about the New Topographics movement, so if there are any questions – let me know. Baltz’s exquisite photographs are small by today’s standards. But they are real prints and you can practically see the silver halides glimmering in the blackness. Definitely worth seeing in person if you get the chance.